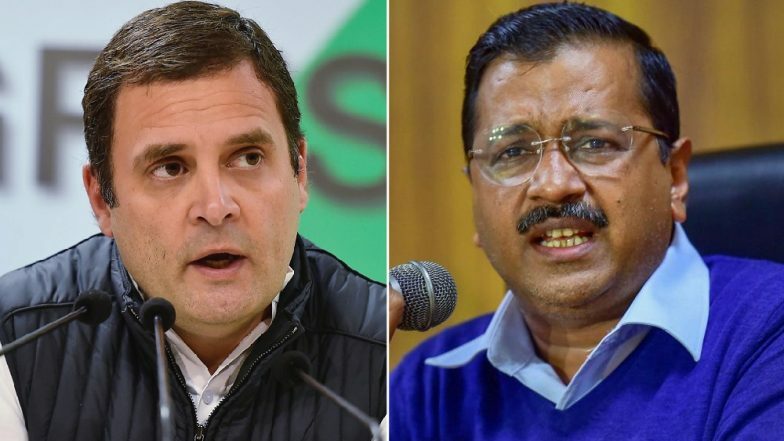 New Delhi, April 15: The AAP-Congress alliance talks struck another roadblock on Monday, with Rahul Gandhi taking it to social media to bash the Aam Aadmi Party convenor, blaming him for the failure to ink a pre-poll pact to taken on the ruling Bharatiya Janata Party. The Gandhi scion's stinging tweet evoked a sharp reaction from Arvind Kejriwal, who counter-charged the Congress of not being "serious" for a coalition. Hitting back at the Congress' chief for levelling the "U-turn" barb against him, the Delhi Chief Minister said Rahul Gandhi has showed his "true intentions" by indicating an end to the alliance talks while the negotiations are still underway. "I am disappointed with such kinds of statements," Kejriwal said, further blaming Rahul Gandhi of indirectly helping Prime Minister Narendra Modi by dividing the anti-BJP votes. "Unfortunately, you are doing the same in UP and other states as well," he added. The "U-turn" jibe, which Rahul Gandhi reiterated against Kejriwal today, has been used by the political rivals of the Delhi CM since 2014 -- when he had dissolved the AAP-Congress government in the national capital within 49 days of its formation. "An alliance between the Congress & AAP in Delhi would mean the rout of the BJP. The Congress is willing to give up 4 Delhi seats to the AAP to ensure this. But, Mr Kejriwal has done yet another U turn! Our doors are still open, but the clock is running out (sic)," he said. A total of 7 parliamentary seats in Delhi will be contested in the sixth phase of Lok Sabha elections 2019, scheduled on May 12. All the 7 constituencies are currently represented BJP MPs.